Can a filter actually work to good for its own good? That is my opinion when it comes to air filters. If you have ever shopped for one you know there is a big price difference between the regular cheap mesh filters and the expensive pleated filters. The truth of the matter is, that unless you or someone in your home is dealing with allergies the pleated ones are overkill. Let me explain. Old-fashioned pleated filters do a decent job of catching dirt. Even if you go past a month before replacing, the filter will continue to work pretty well because it can still sustain an airflow. The dirt in the filter can even help the filter’s job of catching small particles. However, the more expensive pleated ones are so fine and catch such small particles from the beginning, that it can actually restrict air flow if it is not replaced or cleaned properly. 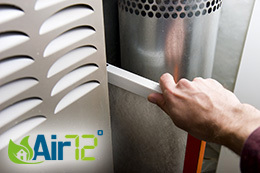 By reducing the air flow through the filter you actually cause your heating or AC unit to work harder. This will only add to your power bill in the end. So you can see that you stand the risk of paying more, both for the filters, and the cost of running your system. That is not to say there is not a place for the pleated filters. As mentioned before, if you or someone in your home suffers from allergies, they are quite effective. Just be certain to replace the filters on a regular schedule. « My Compressor is Dead, What should I do?